Dachgeschosswohnung mit zwei Schlafzimmern für bis zu 6 Personen und zwei privaten Terrassen. Zentral gelegen neben der Plaza de la Encarnación und nur einen kurzen Spaziergang von den wichtigsten Sehenswürdigkeiten und Denkmälern entfernt. Der Wohnbereich ist mit einem "L"-förmigen Sofa, welches auch als Doppelbett genutzt werden kann, einem ausziehbaren Esstisch und Stühlen möbliert. Eine Glastür führt zu einer der beiden Terrassen, welche mit Sonnenschutz und Gartenmöbeln ausgestattet ist. Im Wohnbereich befindet sich auch die offene Küche, welche zur Selbstversorgung mit Geschirr und Kochutensilien ausgetattet ist. Das erste der beiden Schlafzimmer verfügt über zwei zusammengestellte Einzelbetten und einen Kleiderschrank. Eine Glastür führt auf die zweite, ebenfalls möblierte Terrasse. Das zweite Schlafzimmer ist mit zwei Einzelbetten, einem Kleiderschrank und einem Sessel ausgestattet. Das Bad hat Zugang vom Wohnzimmer und ist komplett mit Waschbecken, WC, Bidet und Badewanne ausgestattet. Zur weiteren Ausstattung gehören: WLAN-Internet, Klimaanlage (warm / kalt) in allen Zimmern und Flachbild-TV. "Larana Terrasse 2" liegt strategisch günstig im Zentrum Sevillas, an der Plaza de la Encarnación - Standort des neuen Metropol Parasol. Bei Ihrer Ankunft muss eine Kaution als Sicherheit für eventuelle Schäden hinterlegt werden. Für dieses Objekt beträgt die Kaution: 100 €. Der Restbetrag muss bei Ankunft in Bar, oder per Kreditkarte (Visa, Mastercard), bezahlt werden. 15:00-21:00 Uhr. Aufschlag für Ankünfte von 21:00 bis 00:00 Uhr: 30 EUR (Bezahlung in bar, bei Ankunft). Aufschlag für Ankünfte von 00:00 bis 01:00 Uhr: 50 EUR (Bezahlung in bar, bei Ankunft). Ein früherer Check-in ist möglich, aber abhängig von der Apartmentbelegung. Reduzierte Tarife im Parkhaus "Plaza de la Concordia". Etwa 450 m vom Apartment entfernt. Reservierung per Email notwendig. Wir haben dieses Apartment bewusst zum 2ten Mal gewählt. Die Lage ist ausgezeichnet, der Schnitt der Wohnung mit den 2 Terrassen optimal, die Ausstattung sehr gut, die Hilfsbereitschaft der Vermieter sehr groß. Also, alles passt! This apartment is just great. It was very spacious for our family of 4, walking distance to everything, AC and air conditioning working and the two terraces have amazing views. Communication was flawless beforehand. Carlos was waiting for us and explained us everything. He was also right there when we called him later during our stay. Appartement bien situé, lumineux, confortable. Not much to add to the previous reviews. Everything was perfect, location is great. With 3 friends we had a lovely stay. We had some small issues (broken electric kettle, missing bed lamps), which were solved quickly by the kind owners. Will not hesitate to come back! Système navette aéroport à revoir, le chauffeur n'était ps à l'aéroport. "A Fantastic place in a fantastic city!" View is wonderful and apartment was well maintained. 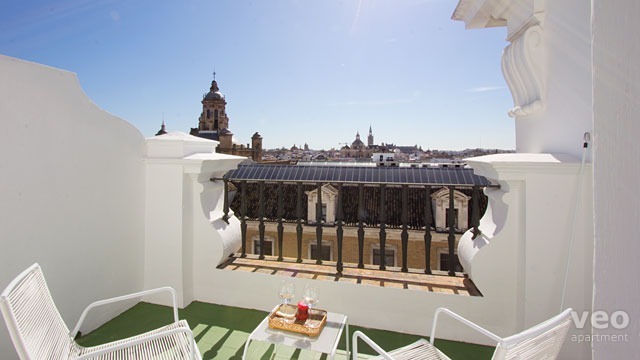 The mattresses were a little hard for our tastes, but otherwise this was a wonderful choice for a family or couple who wants to be able to cook and wash while staying in Seville. "Bel appartement en plein coeur de séville"
"Appartement tres bien situé, tres confortable et propre." Appartement très confortable, agréable à vivre et tout proche du centre de Séville, tres bon qualité/prix, très bon accueil. Seul "inconvenient": on entend la circulation dans la rue. Un appartement très agréable situé au centre touristique : nous avons fait toutes les visites à pied. A proximité, un centre commercial et un marché qui permettent de se ravitailler facilement et toujours à pied. 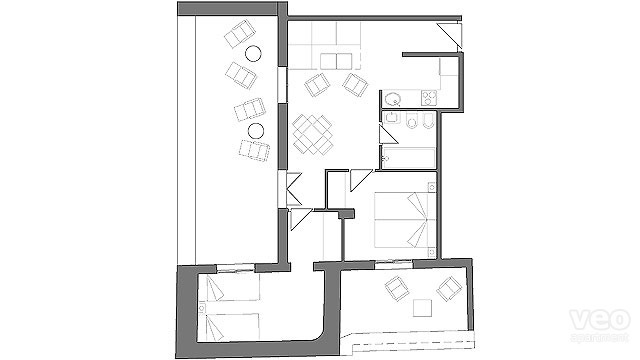 Un appartement très propre, avec 2 belles terrasses, bien conçu pour 4 personnes maximum (parce qu'il n'y a qu'une seule salle de bain) et calme. 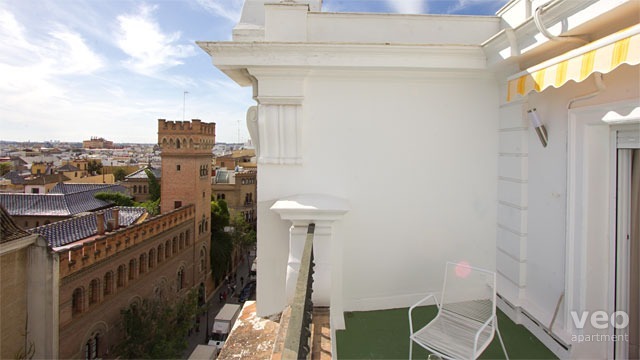 "Bel appartement en plein centre de Seville avec une superbe vue sur la ville"
appartement spacieux et propre, conforme aux photos, très bien situé en plein centre de SEVILLE. tout est accessible à pied: monuments,centre historique, rues commerçantes,restaurants et commerces de proximité. 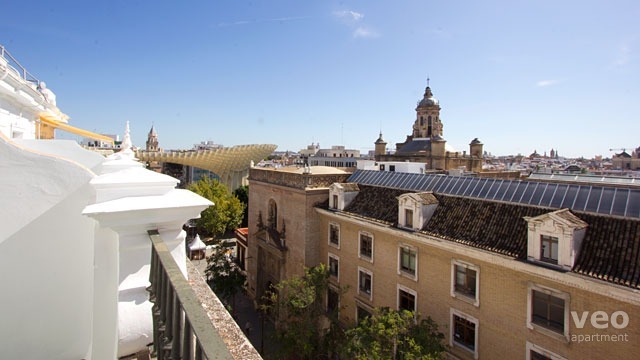 une des terrasses dispose dune vue magnifique sur le centre de Seville et ces monuments. un vrai régal. très bien situé pour visiter séville, l'appartement est agréable, fonctionnel et moderne. Il offre 2 vues sur les toits de Séville. Il est situé au dernier étage d'un immeuble avec ascenseur. Le propriétaire, Daniel, est accueillant et disponible si besoin. "Visiter Séville ? C'est là que vous devez aller !" Appartement confortable et agréable. Dommage qu'il n'y ai pas 1 salle de douche pour chauque chambre. 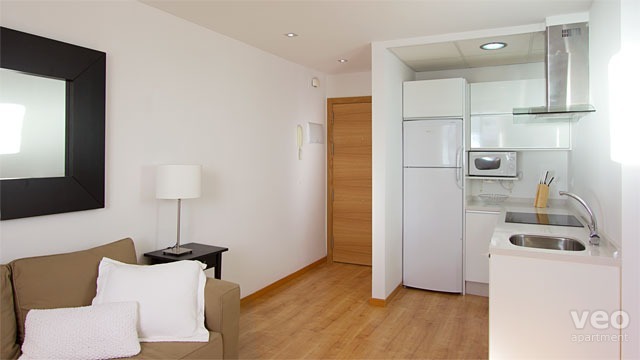 "We had a fantastic stay in seville and the apartment was part of it." 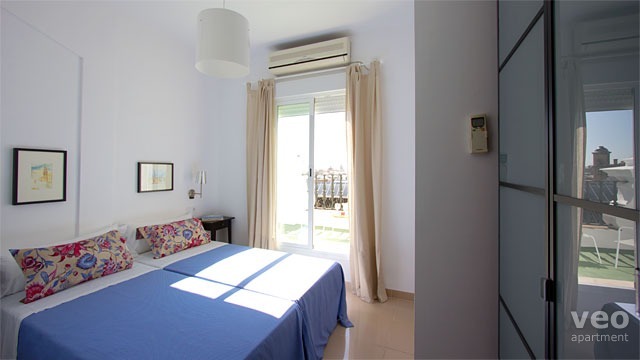 This apartment is wonderfully situated with lovely views from its 2 terraces.At night particularly the view over to the cathedral was stunning. The apartment was spacious enough for the 3 of us and well equipped although it would have been nice to have some bigger cups/mugs and the utensils for cooking other than knives were a bit sparse. The apartment manager and his son were extremely helpful. The beds were comfy and the airconditioning worked well.Overall we rated it very highly and would return. "Fantastic location and beautiful outlook." The apartment had everything you needed, was centrally located and the personal touch of a quick run down of Seville with a map was much appreciated. Great shopping area and plenty of food choices. We had a great time in this beautiful apartment. Two terraces with great views, Stylish, modern interior and great central location. The owner Daniel was very helpful and welcoming. The September weather was wonderful and we ate breakfast on the terrace every day. 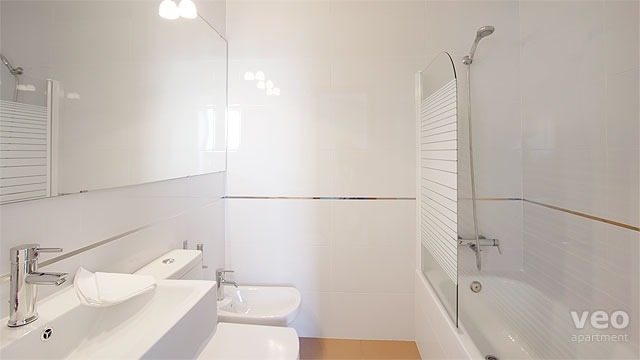 The air conditioning in both bedrooms and living space worked very well, and the bathroom was spotlessly clean. We would certainly recommend the apartment and Veoapartment, and will use them again. 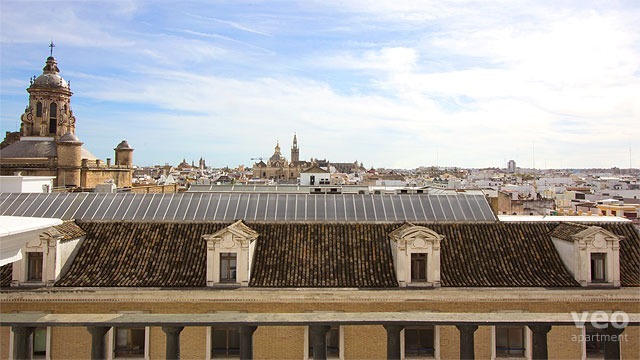 Super appartement en centre ville, avec des vues merveilleuses sur les toits de Seville depuis les deux terrasses. Aucune faute de goût sur l'aménagement. Propre et fonctionnel. Accueil très sympatique. Nous reviendrons sûrement!!! Very nice place, roomy, clean. Good value if 4 or 5 people. Great terraces. Excellent location. Good AC. Kitchen a little sparsely equipped, needs some paper products, basics. "Wonderful apartment in a very good condition." We were very happy with the apartment. It was clean, had most of what we needed and good comfort. I'd be happy to use veoapartment again. Service from the company was also good. The awning didn't work on one of the balconies, but it didn't bother us very much. 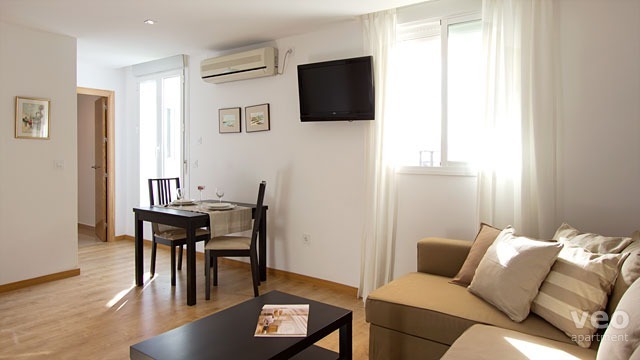 "A comfortable and well located base in Seville"
The apartment was ideal for our family of 4 with all we needed and comfortable beds. It was very clean and well thought out and the owners were very kind, informative and welcoming. It was a bonus being on the corner as we had two terraces both with excellent views. 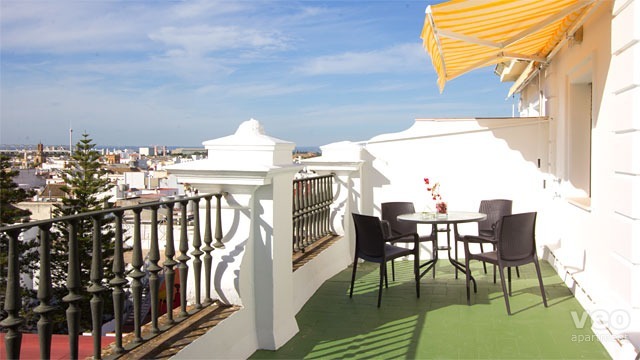 Having that private outside space was great as after walking for miles around Seville we could relax in the sun. 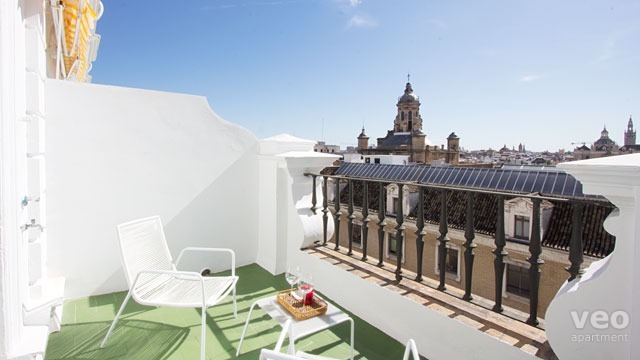 "The perfect apartment for Seville." Simply awesome. Two 60 year old parents and a 28 year old daughter on spring break from her teaching job stayed here. Plenty of privacy for both--and both had a terrace! We sat on the "big" terrace and sipped wine and had a light meal before heading over to a flamenco show. This apartment was stocked with basics including washing machine detergent. Spotlessly clean. Lovely building. Fabulous location near the cathedral and everything else, including a taxi stand to get us to the train station! "Central location and great views"
Fantastic location, lovely views, clean quiet and comfortable. Daniel very welcoming and helpful. A great place for a family to stay in this lovely city. "We loved our apartment and would stay here again!" Excellent! Perfect location, very clean and well equipped! We felt very safe here. Views from terraces are gorgeous. Daniel met us at our apartment as promised and went over details quite thoroughly. He even had maps of the city and showed us where we were and other must see areas. Such a nice man!